Now that the kids have been back-to-school for a month, we are starting to get the hang of our new schedules. I am happy to report that so far, homework hasn’t been too bad (knocking on wood as we speak). We have successfully completed 3 weeks of homework packets and I haven’t cried once! One of the things that has been meaning to make for a while now is a desk for my son’s room so he can have a place to do some work without his loving sister disrupting him. 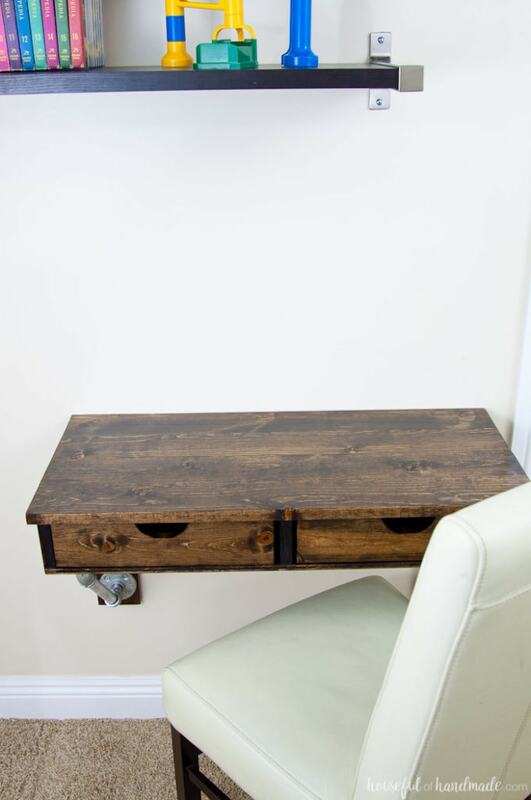 So last week I made him this easy rustic industrial wall-mounted desk and he loves it. 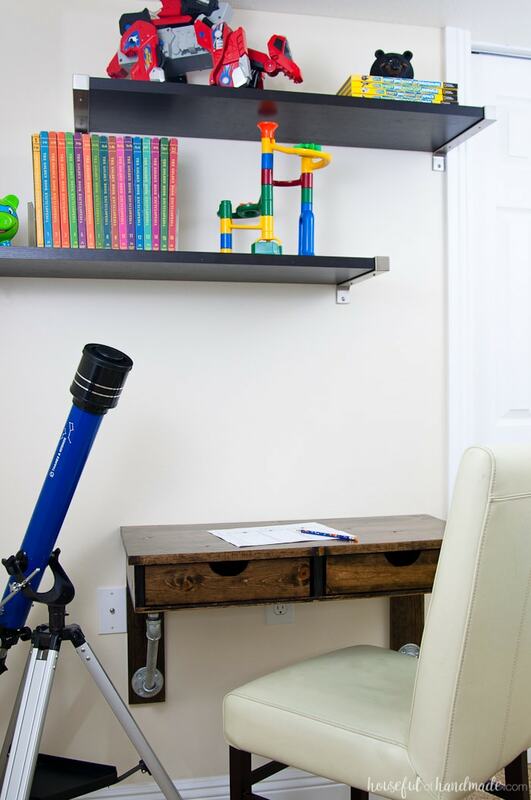 When I started working on plans for my son’s desk, the one thing I really wanted was a wall-mounted desk. Why? 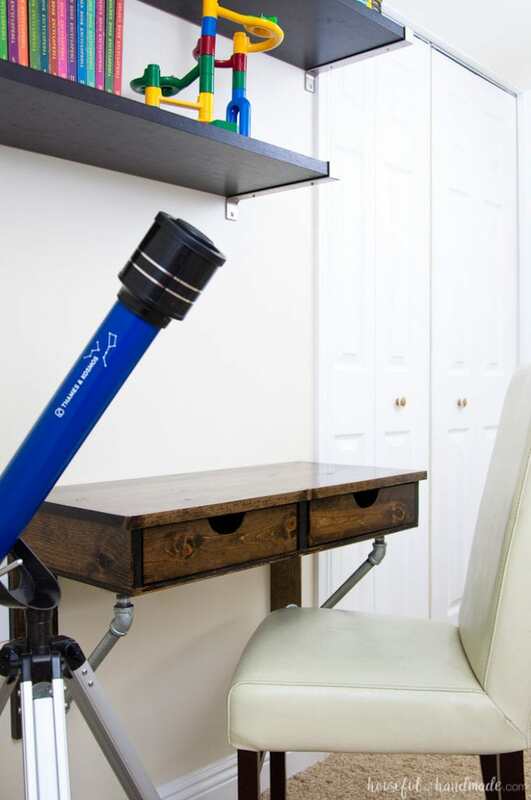 Because if the desk is mounted on the wall, it will be easier clean under! For some reason, he is super good at shoving toys, clothes, shoes and anything else he’s suppose to be cleaning up under anything he can. And then they get lost forever. We searched for over a month for one of his new shoes that was lost under a blanket on a bed. Seriously, he’s that good! So having a desk that doesn’t give him another hiding spot was important. I also wanted a desk that was manly. Something that he will love even when he grows up into a teenager (hopefully I have many years before that happens). So I stained the desk with a dark walnut stain and added the galvanized steel accents. Now it fits into his room perfectly and he will be able to use if for years to come. Lastly, I knew he would need drawers on his new desk. I really hate desks without drawers, where are you suppose to keep your pencils, tape, etc. I know I am probably asking for him to just stash all kinds of things in those drawers, but hopefully they will also be used for holding office supplies. Hey, a mother can always hope! For this build I decided to keep it simple. Sometimes simple is good. 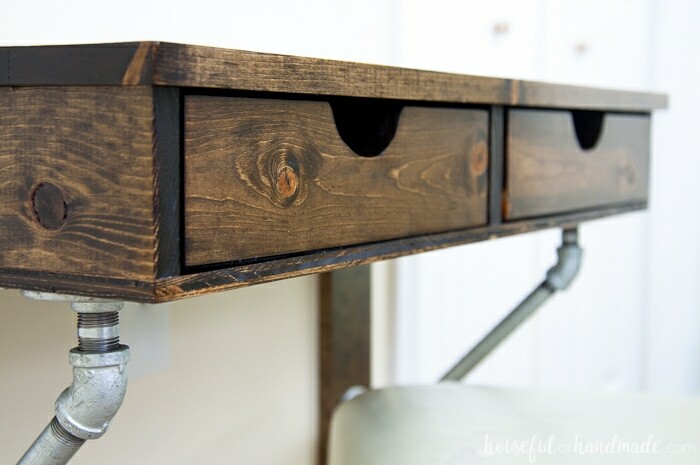 I partnered with Kreg Jig to make this desk and it’s drawers using super sturdy and super easy pocket holes. 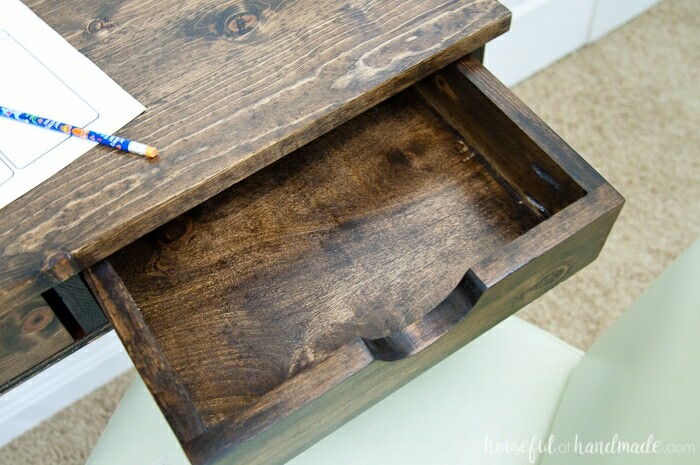 If you have any experience with woodworking, you can put this desk together in an afternoon, including these super easy drawers. It will take a few days to stain and add the protective finish, but most of that time is spent waiting for things to dry. It took me less than an hour for each finishing coat. And the way I made the drawers for this desk, they do not need drawer glides! Sometimes those can be a huge pain to install. But these drawers do not need it. The size of the drawer space and the size of the drawers means you can just slide the drawers into the desk and they fit beautifully. I added some felt to the bottom of the drawers and they slide in and out like butter. Another bonus, I don’t have to worry about a rowdy boy breaking the drawer glides! My son is totally loving his new desk. But of course I decided to take it one step further and give him the perfect space to do homework. I added a couple shelves that I bought at Ikea using the metal shelf brackets so it tied in nicely with the galvanized steel on the desk. Then filled them up with some vintage encyclopedias that his grandfather gave him for his birthday. 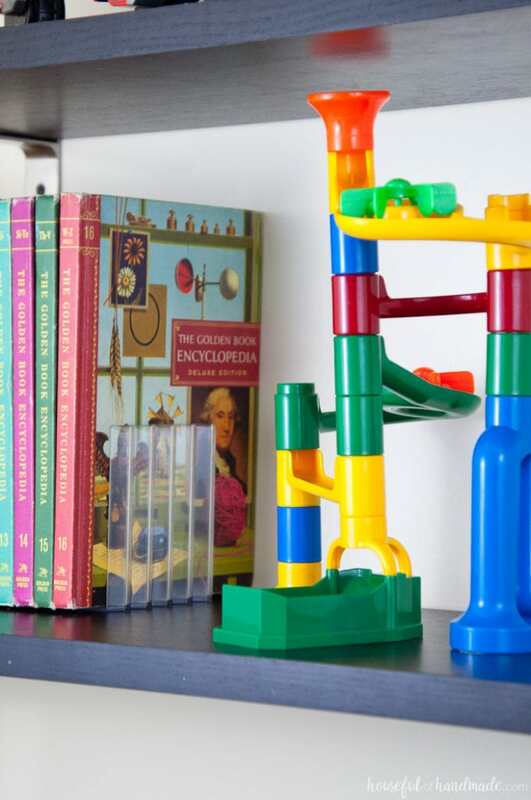 We added a few more of his favorite books (of course they are also information books because he is my little fact boy) and a few of his favorite toys. Now he has the perfect hideaway in his room. 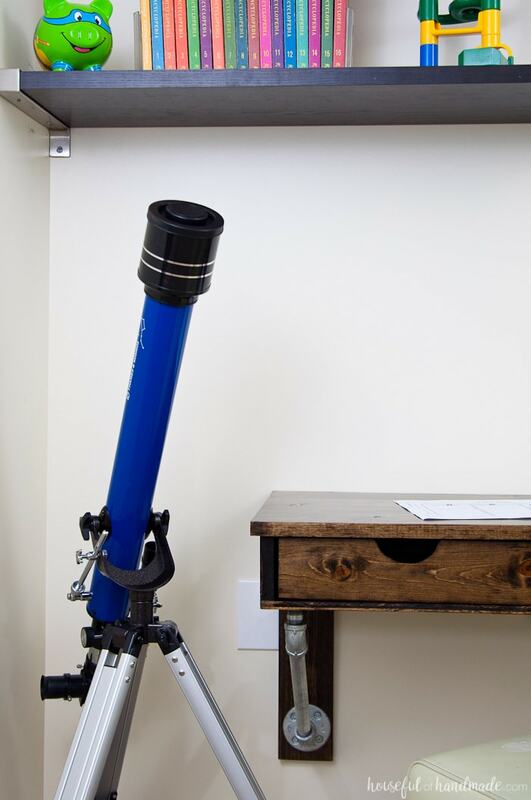 Finally, when I mounted the desk, I made sure to leave room for his telescope to sit next to it. What little boy doesn’t love a telescope. And it fits nicely in the nook in his room so it’s ready to go whenever we need to see the stars. I am pretty excited that his new boy bedroom is starting to come together. Next I need to figure out how to contain all his Legos and action figures! But that’s a project for another day. 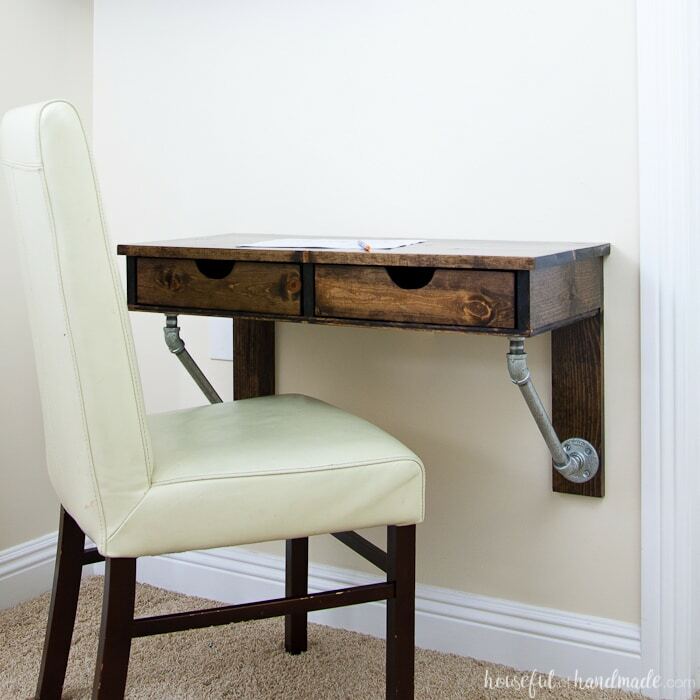 If you are ready to build your own rustic industrial wall-mounted desk, you can find the free plans over at Kreg Tool’s new DIY project plan site BuildSomething. Click here for the free build plans for this desk. Hi there, I follow you on IG & just found your blog. This desk came out beautiful! Do you have any DIY instructions to make it, or what size wood you used to create everything? I’d love to do something similar in my home! Kati, this is FANTASTIC!!! What a beautiful desk and space saver!! Thank you! I love that it doesn’t take up too much space too. This is a great idea! I love the style! I love this!! What a great idea and so cool! Thanks for sharing, Pinning! Oh Kati, you are a girl after my own heart! I love, love this desk! Industrial is totally up my alley and this is the perfect mix of metal and wood! Pinning! What a great idea! When my kids get a little older I want to make something similar to this! Thanks Lindsey! 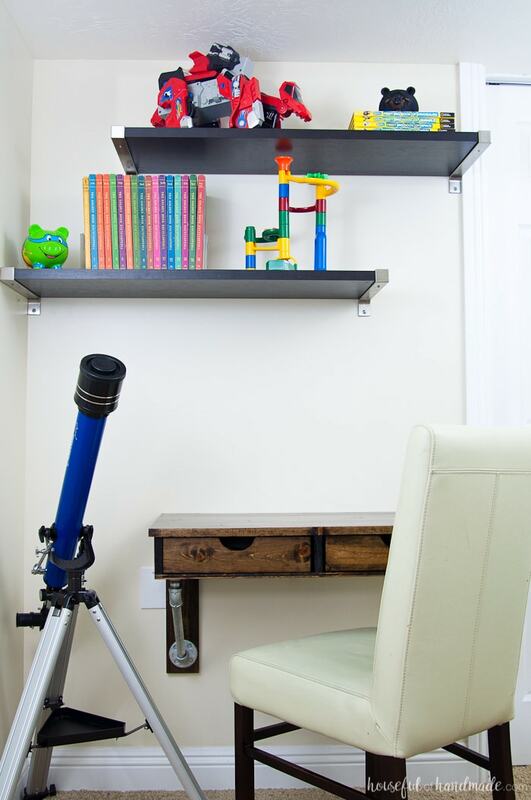 It’s the perfect desk for a kids space. I hope you do steal the idea. My son is loving his new desk. Hey what a cool idea! Love the pipes, they must be super cost effective too! The pipes are fun, and hopefully make it a bit more masculine for him. THIS is amazing! 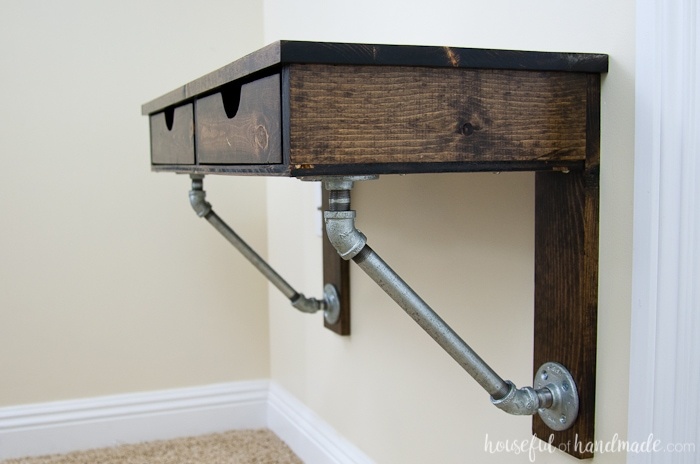 I love the dark walnut stain and galvanized look. So perfect! Pinning! Thanks Brooke. 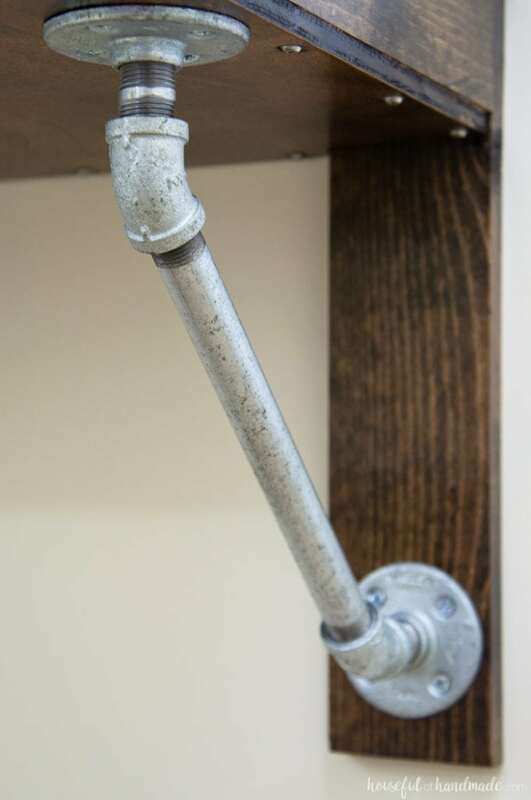 The dark stain and galvanized metal together is my new favorite.